Transforming the market for electric cars: The solution to "Range Anxiety"
Building the market for electric cars presents a tricky conundrum: charging. People are less likely to want to buy an electric car if they are uncertain about being able to get it charged, and charging stations are not likely to pop up to serve these vehicles if there are few electric cars around. This fear of running out of charge, "range anxiety," is a significant obstacle to more widespread adoption. I believe a forward-looking gas company can help break this logjam while also improving their market positioning. Here's how. Suppose one company, let's say Shell, installed chargers in every one of their stations in the Greater Washington area (or another region where there are electric cars on the road). The key here is to install in every station, even though many will hardly get used. It's a marketing strategy: make your stations synonymous with electric charging. One company getting out ahead on this could create a very long lasting market advantage. Put a charger in every station and make that information common knowledge to everyone. The marketing has to be comprehensive, so that everyone knows those gas stations have charging stations; it becomes common knowledge. The stations and the marketing are loss leaders; a marketing strategy that pays off in more than one way. In a short op-ed piece today in the Washington Post (January 26, 2012), Robert Samuelson invokes a strange reality on our future. "A week after President Obama denied the application for the Keystone XL pipeline — which would carry oil from Canada’s tar sands deposits in Alberta to U.S. refineries along the Gulf of Mexico — it’s time for an energy reality check. What does the future hold? It may be better than you think." That's how he starts the article. Not that he supports the canceling of the KXL pipeline. No, he's optimistic because we will continue to burn fossil fuels on into the interminable future no matter what. That's the "better than you think" line. W&OD/Custis Trail east of Sycamore Street with the East Falls Church Metro station. The current footbridge is very narrow, very old and has become obsolete. Its replacement is necessary for safety reasons. 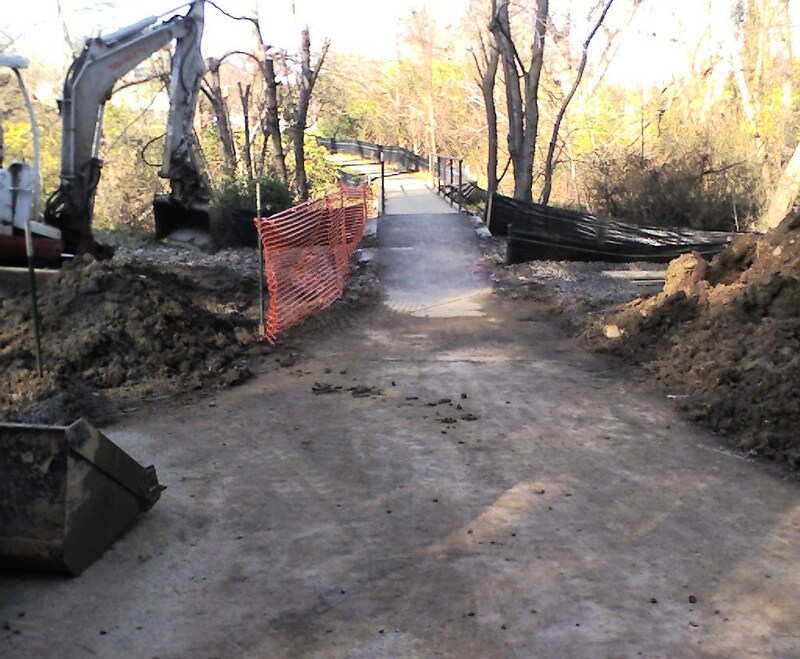 However, with input from the Arlington County pedestrian and bicycle advisory committees, the County has taken advantage of this opportunity to improve the bridge. 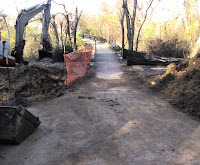 The replacement bridge will meet ADA standards, will be wider and is in a better location for reducing confusion among trail users. 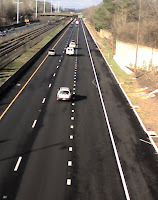 The project to widen I-66 westbound between Fairfax Drive and Sycamore Street is now completed. 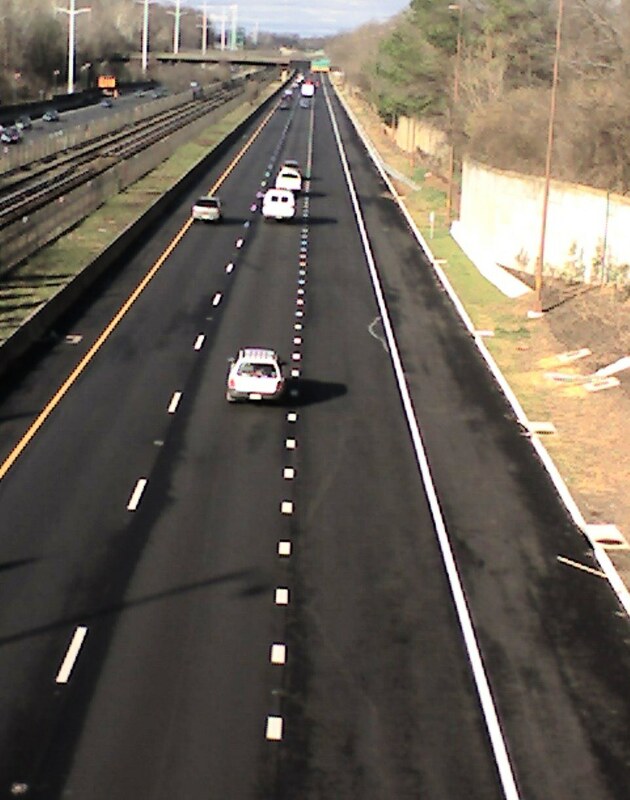 This is one of several projects that VDOT calls "Spot Improvements." In this case, the "spot" is about 1.5 miles long (map). This is the first of these projects, and was begun in the summer of 2010. Neither of the other two projects is currently underway nor scheduled for the immediate future. Arlington County has created a public Google Map that people can edit with bollard locations and issues. In particular, they are asking for locations where bollard collars (that part in the ground that holds the bollard itself) may be sticking up causing a hazard. Since we have the map, it will also be useful for identifying other bollard-related locations, such as where bollards are needed or where they should be removed. I have posted on this topic before (here and here). Those who know me know that I am opposed to bollards in general and believe they should only be installed where there is documented need, rather than at every intersection just as a policy. The W&OD trail removed all its bollards along the entire 45 miles some years back and experiences few problems with cars. Not zero, though. However, they have decided that the positive aspects of better aesthetics and safer travel for cyclists outweigh the negatives of a rare car encroaching on the trail. Please check the map out and add any locations that you believe could use attention. It's easy, just click on the EDIT button and you will be able to edit the map. Remember to save when you are done. Thanks for your help.